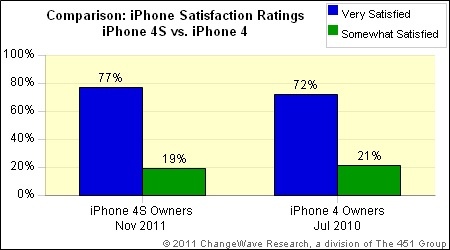 Changewave, a market research firm, has just released the results of a November survey of ~200 iPhone 4S owners. The survey found that 96% of respondents were ‘very satisfied’ or ‘somewhat satisfied’ with the iPhone 4S. In comparison, the iPhone 4 achieved a satisfaction rate of 93% in 2010. As would be expected, Siri and the 8-megapixel camera topped the list of most-liked features while the lack of 4G and battery life issues were cited as the biggest drawbacks of the iPhone 4S.